Greenshade, a land of flowing rivers and fertile plains, occupies the southwest portion of Valenwood. The port city of Woodhearth sits upon the western shore, while other towns include Marbruk and Greenheart. Greenshade is a large region of western Valenwood, lush with life under its canopy with rivers coursing through the land. It contains the towns of Marbruk and Woodhearth. The Thalmor of the Aldmeri Dominion have worked towards "civilizing" the region, but have met resistance in eradicating widespread practices, such as Daedra worship. Abecean Sea — A pirate-ridden sea within the Eltheric Ocean. 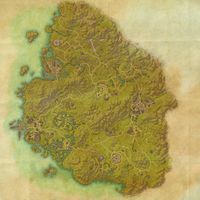 Isles of Torment — A pocket-plane of Coldharbour, mystically connected to the Moonhenge in Greenshade. Silatar — An island estate in the Summerset archipelago. The Staff of Magnus: Retrieve the Staff of Magnus from the Marbruk vault. Frighten the Fearsome: Earn the Bramblebreach Clan's trust. Audience with the Wilderking: Expose a Veiled Heritance plot to kill the Wilderking. The Spinner's Tale: Seek out the spinner in the depths of Wilderking Court. The Witch of Silatar: Explore Aranias' past on Silatar. Throne of the Wilderking: Protect the Wilderking from the Veiled Heritance. Woodhearth: Travel to the Drowned Coast city of Woodhearth. A Storm Upon the Shore: Drive the Sea Vipers out of Seaside Sanctuary. Report to Marbruk: Deliver news of events in the Drowned Coast to Queen Ayrenn. Naemon's Return: Rally the defenses of Marbruk at Driladan Pass. Retaking the Pass: Defeat the undead army and rescue the Mane. The Blight of the Bosmer: Cleanse Verrant Morass of the Shade's blight. Right of Theft: Uncover the secret of the Blackroot Clan. To Velyn Harbor: Find the Green Lady in Malabal Tor. Aid for Bramblebreach: Assist the Bosmer at Bramblebreach at the request of the Wilderking. Breaking the Ward: Assist the Vinedusk Rangers across Green's Marrow. The Dead King: Stop the Worm Cult from resurrecting an Ayleid king. Deadly Ambition: Investigate the disappearance of the Mages Guild on the moors. 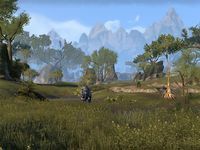 The Flooded Grove: Help protect Greenshade from Daedra. Lost in the Mist: Search for a Bosmer's missing wife. The Merethic Collection: Recover priceless artifacts within Rulanyil's Fall. Mist and Shadow: Investigate the mysterious mist in Shademist Moors. Scaled Captors: Rescue a Bosmer scouting party from their Argonian captors. Beasts of Falinesti: Track down a Falinesti Faithful who broke her pact with Y'ffre. The Falinesti Faithful: Rescue the Falinesti Faithful from the Wood Orcs. Hunting the Mammoth: Help a hunter track and kill a timber mammoth. Moonhenge's Tear: Defeat the Daedra emerging from a portal at Moonhenge. Mourning the Lost: Help a lovelorn Altmer reunite with his Bosmer bride-to-be. The Senche: Track the pale senche for the hunter Haras. Swift Justice: Apprehend a traitor to the Dominion. Razor's Edge: Drive back the Daedra from a burning Bosmeri city. Return to Ash: Enter the Deadlands to rescue a failed invasion force. 5 items: Ignore the Movement Speed penalty of Sneak. 5 items: Your Bow abilities reduce the Movement Speed of any enemy they hit by 30% for 3 seconds. 5 items: When you deal damage with a Flame Damage ability, you have a 15% chance apply the Burning status effect to the enemy and increase your Spell Damage by 6-525 for 8 seconds. This effect can occur once every 12 seconds. 5 items: When you deal damage with a fully-charged Heavy Attack, you have a 50% chance increase your Spell Resistance by 40-3440 and deal 12-1032 Flame damage to all enemies within 5 meters of you every 1 second for 6 seconds. 2 items: When you use a damage shield ability, you have a 50% chance to lob 3 mortars over 2 seconds at the furthest enemy from you that each deal 63-5500 Flame damage to all enemies within 5 meters of the blast area. This effect can occur once every 6 seconds. 2 items: When you deal damage with a damage over time effect, you have a 8% chance to summon a meteor that deals 104-9000 Flame damage to the target and 46-4000 Flame damage to all other enemies within 5 meters. This effect can occur once every 5 seconds. 5 items: While you are blocking you gain Major Evasion, reducing damage from area attacks by 25%. 5 items: When you cast a Magicka ability, you have an 8% chance to negate that ability's cost. 5 items: When you take damage while you are under 30% Health, you gain a damage shield that absorbs 120-10320 damage for 8 seconds. This effect can occur once every 15 seconds. This page was last modified on 8 November 2018, at 09:38.